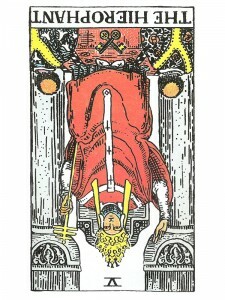 The Hierophant (R) tells you that a “limiting” mind does not accept the present reality – regardless of what it is. It is always unsatisfied, which creates emotional disappointment and soon develops into physical setbacks. Life is a learning process – we learn from our successes and our mistakes for they represent areas for personal growth and breakthrough. You have a keen sense of originality, you are not afraid to undertake new ventures because you have an open mind. Accept the responsibility of truly finding your own way and begin to form your own original ideas. Recognize the free spirit that glows within your soul – it is the new adventures that will make you whole. Someone will listen to your ideas – so never be afraid to speak your mind or do what you feel is best. Have the courage of your convictions – there are always new and refreshing vibrations coming into your life that will promote a open mind and a frank outlook on life if you will just learn to be receptive to them. Over-attachment and blind acceptance/following. Just as you are eventually kicked out of your mother’s physical/emotional nest, so too will your own mind kick you out of an outdated mental nest that is no longer comfortable. To the neurotic, this looking outside of the self for the accepted norm of behavior can become literally “the voice of God.” We exist in a system, by the grace of that system into which we are born, but then we must decide for ourselves how we want to use, to adapt, to change that system and so pass it on to the next generation. Some of us choose a personal system very much like our parent/ predecessors, but we must “choose it” not blindly follow it. Others of us strike out on very different paths from the map handed to us. Who are you looking to for assistance, direction or learning? What law or rule do you feel you have transgressed and who would hold you accountable? What traditions are you upholding? What traditions are you rebelling against? In the third position: Truth is to be presented in a package that is highly palatable – do not miss it – for it has been cooked especially for you. Be patient – this is a group to which you want to listen and participate with. It will become more concrete with time; that is why you are to be involved. In the sixth position: Ask yourself whether your belief system, your adherence to the collective faith, is opening your heart or closing it. In the seventh position: Don’t ask questions when you have none to ask or forget to ask them when you have one. In the eighth position: You can lead a horse to water but you can’t make him drink – it is as it should be. In the ninth position: Too much immersion in a belief is actually a suspension of that belief – just as much as if you had refuted that belief to begin with. The heart will help you balance between belief and non-belief, between faith and doubt, between yourself and your group.